Just two weeks after one of the greatest days in the club’s recent history, The Blues were again urgently in need of a replacement goalkeeper. 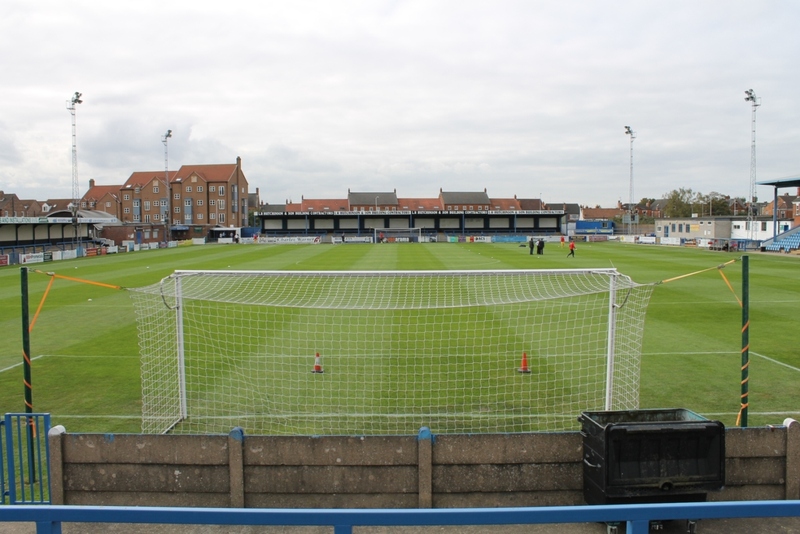 Though formerly members of Division 2 – finishing as high as sixth in 1905 – Gainsborough Trinity dropped out of the league in 1912, when local rivals Lincoln City were voted in to replace them. Since that moment, their major highs appear to have come solely against League opposition in the FA Cup. Although Crewe may have been the first league side, to be dispatched by Gainsborough’s then Midland League outfit; quite notably in 1997 Lincoln City almost became the last, as Trinity pushed for their fifteenth 2nd Round appearance. It should of course be noted that; the only times Watford and Gainsborough Trinity have ever faced each other were also in the FA Cup, just twice, with each club winning once. With all this racing round my mind, driving up to Lincolnshire, the magic of The FA Cup was naturally once again occupying all my thoughts. 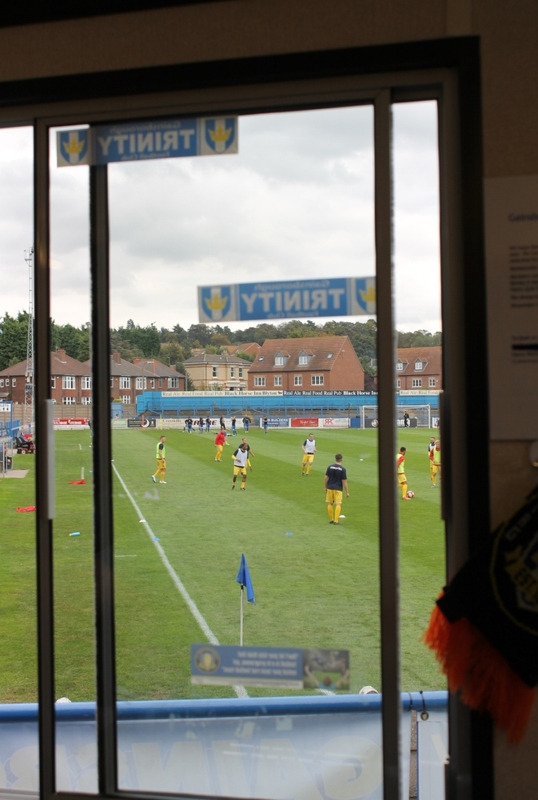 Now the starting point for all sixth tier clubs, this 2nd Qualifying Round tie was to be Gainsborough’s first in this season’s competition; impressively their opponents had already negotiated two rounds. Despite these fine victories, Farsley were no match for the Conference North club this afternoon. Two nil down at the break, by the end, not even a deflected Lewis Nightingale free kick could save them from a relatively fair 4-1 defeat. Totally dominating parts of the game, Gainsborough took the lead through the kind of goal every child dreams of scoring; a sublime Ciaran Toner volley from the edge of the box. The second was bundled home by Liam Davis after some tenacious play by Simon Russell. Following a rare second half Farsley attack, Dom Roma was on the end of a fine break for the third and, Russell bagged the fourth. Quite literally, by all accounts; back in 1997, Gainsborough had equally dominated an FA Cup encounter, in the 1st Round, against their former replacements, Lincoln City. The start of that season wasn’t perfect but, after losing a County Cup match in July, Trinity went undefeated in the next seven encounters. 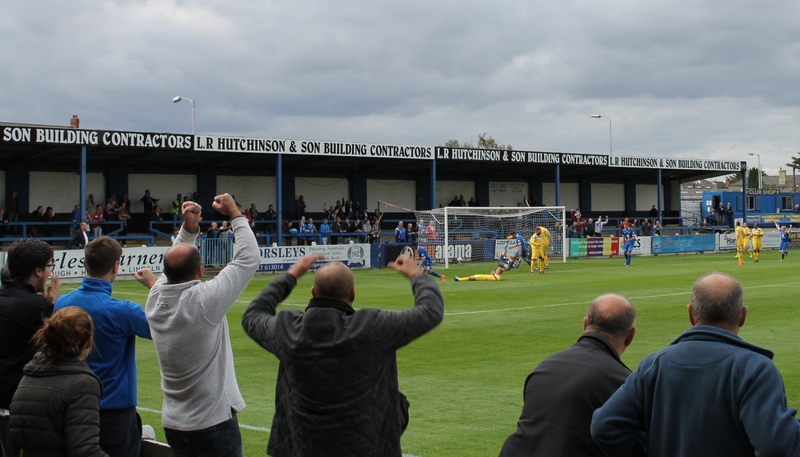 Whilst their third league defeat wouldn’t arrive until November, a winning run of twelve Autumnal games saw The Blues blast their way through The FA Cup’s qualifying rounds. 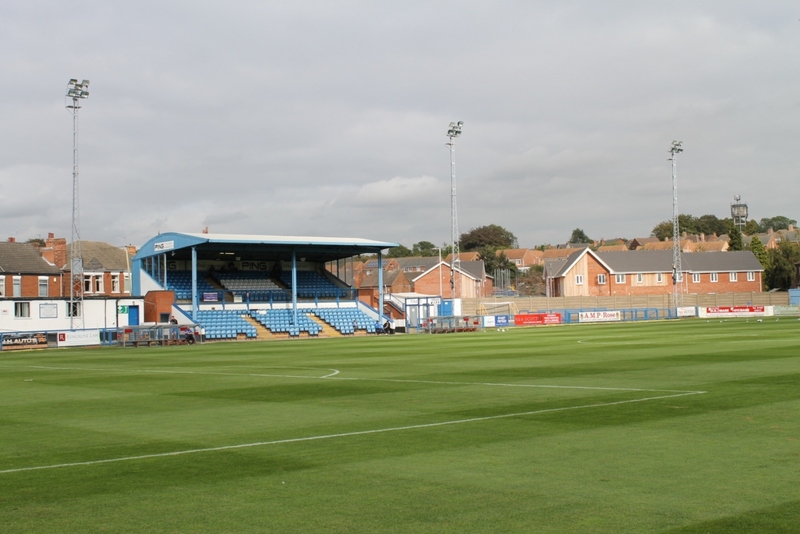 Arriving from Gateshead – where Steve told me he had been moved down the pecking order, when a young Steve Harper arrived on loan from Newcastle United – Sherwood was attracted to Gainsborough by the presence of the legendary Ernie Moss. Proudly Chesterfield’s record goal scorer and appearance maker; Ernie was by then also making a name for himself in Non League management, even winning silverware for Gainsborough the season before. Though Ernie, Frank and Steve never graced the same field together, their connections with clubs in the area ran deep. Coupled with his league experience living in Grimsby was the key, Frank explained, to Sherwood being approached to become Trinity’s first choice keeper. 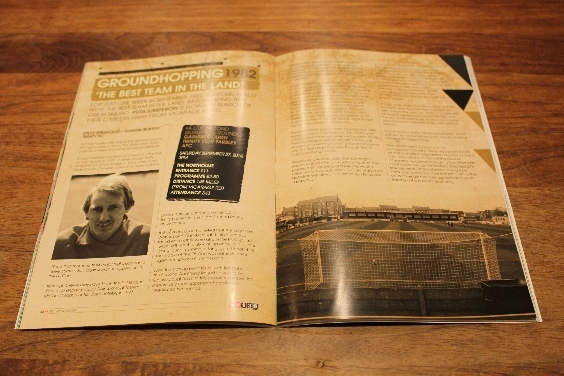 Born in nearby Selby, Steve had played “a few games” for his hometown club ahead of being scouted for bigger things. Prior to ultimately signing for a “so professional” Chelsea, Steve recounted jovially his trial at Sheffield Wednesday and the moment that “they left me at the training ground” afterwards. As connections go, a few years later Frank would turn out for Sheffield Wednesday’s reserves whilst, at The Mariners, it would be Frank who would don their shirt first. Even further on, both would turn their experience to youth training in this area of the country. Whilst Frank set up and ran both Gainsborough United and Gainsborough Town, as feeder clubs for Trinity, Steve ran his own goalkeeping school in Grimsby and, also assisted Keith Alexander with coaching at Lincoln. By that time however – encouraged by Leeds’ Mick Bates career path – Steve was already considering a post-footballing career with Allied Dunbar. 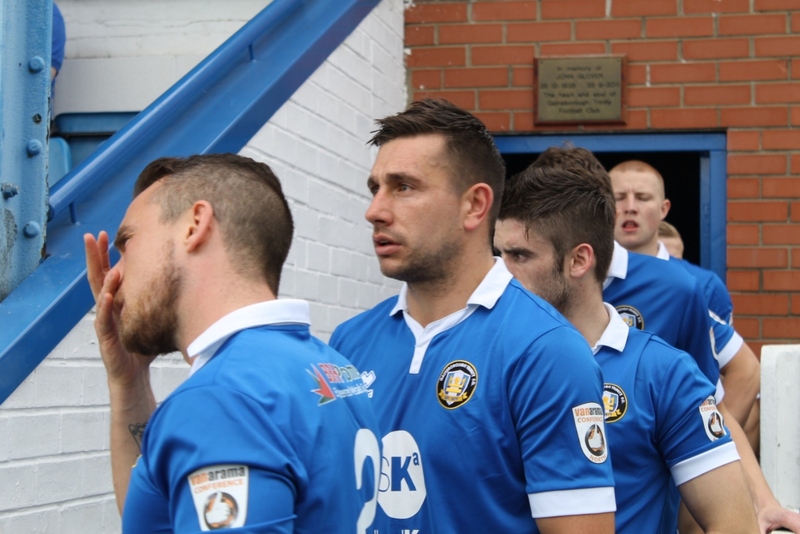 After a “very enjoyable spell” in Gateshead with a “decent bunch of players”, Steve was thrust straight into the action as Gainsborough had no other keeper on their books at the time, and by chance, within a month he was facing his old teammates in The Cup. Though he didn’t train regularly, Sherwood played every in Blues’ game; league and cup. Having dispatch of Witton Albion 5-0 in the FA Cup 1st Qualifying Round, Gainsborough soon made short work of Gateshead 4-1 away, before beating South Shields 3-2 in the next round. 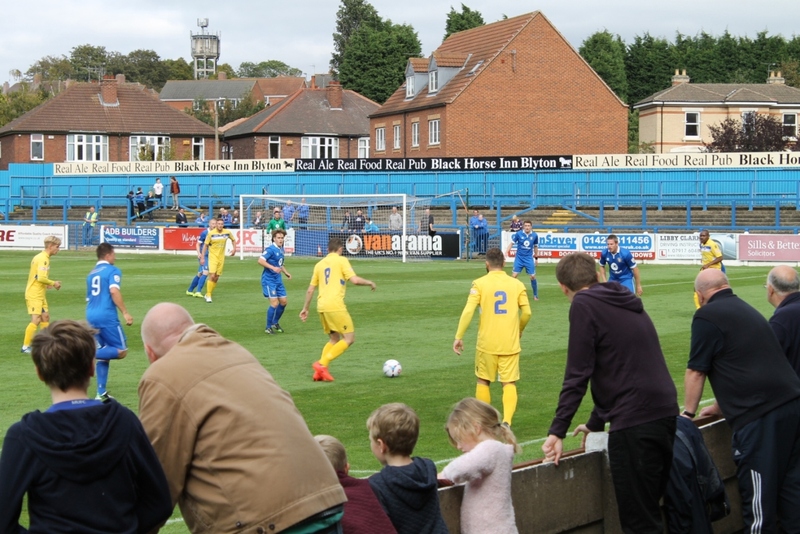 Being the gateway to the big boys, their following 4th Qualifying Round against Halifax however was a notable one for both Steve and the club. A goal up with just minutes to go, Steve pulled off what others described as a “brilliant save” to deny a spritely Geoff Horsfield. “Even at that point in my career, it was a bit special” added Sherwood jovially with obvious pride in his tone. For the 1st Round local rivals Lincoln City should have come to town but – with a huge gate expected – the police forced the game to be moved to Sincil Bank. Even to die-hard Imps, the ninety minutes wasn’t their best. “If we’d had more bite up front, we’d have beaten Lincoln” Sherwood, continued “I hardly had anything to do.” Almost snatching it at the death; with the game resting at 1-1 Frank explained, “In the first game, in the last few minutes, Grant Morrow forced a game-saving block from Barry Richardson” (Sherwood’s former teammate at Northampton). 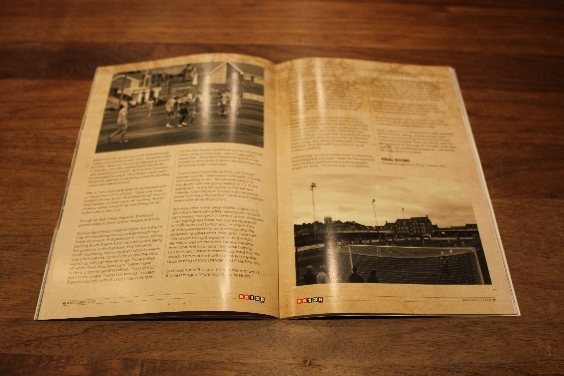 Ten days later, in the away replay – again at a Sincil Bank filled with 6000+ spectators – Lincoln just scraped through 3-2. Defeat or nor not, everyone I met highlighted these two games as special in Trinity eyes and to that end; in unison they all acknowledged the work of Moss and the defensive qualities of his Trinity side. I was told, “Sherwood brought experience to the side. He talked well on the pitch. He was helping them [the defence] and they were helping him in return.” Steve himself recognised that he couldn’t have done it without the fine centre back pairing of Paul Ellender and Chris Timmins. 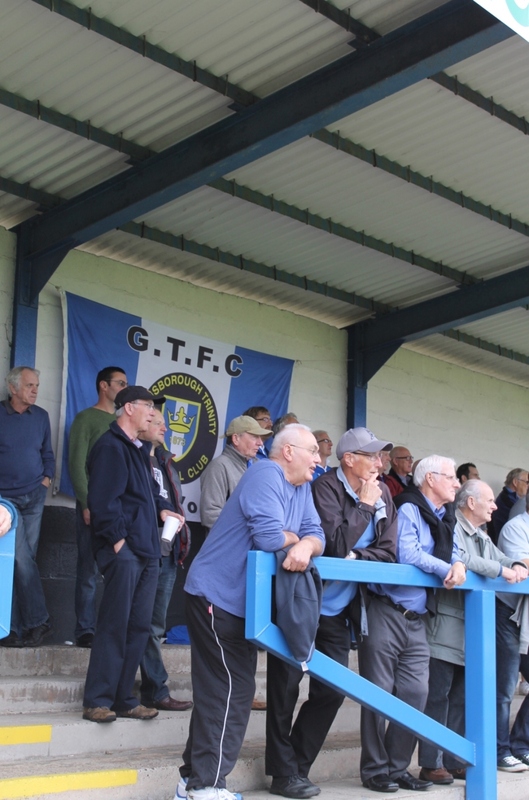 Dumped out of The Cup; back in real world, the next league fixture took Trinity to North Wales. The Colwyn Bay pitch that night was, Frank described “like a slag heap”; an opinion that probably bears the greatest inclination into Sherwood’s ultimate retirement. Over the phone Sherwood confirmed he’s never played since, not even for the Watford Legends. Without regrets however, he reasoned his career choice, “Like most goalkeepers, I was as daft as a bat… yet totally committed.” He wouldn’t focus on more than one thing at a time and wanted to play so much that he admitted once trying, and failing, to persuade Cobblers’ manager John Barnwell to put him on as an outfield substitute. Having gone through some “interesting times” in the interim, Trinity isn’t currently quite at the peak of its powers; they may possibly never move from the level they seem so cemented to. Clearly however there are many very positive aspects about this club; predominantly from those therein and the stabilising effect they are now having. Whilst it’s not often one gets offered a hi-viz jacket and the freedom of a club, it’s more pleasing to find the off-field comments were just as engaging as the play before us. Whatever happens going forward, the magic of the FA Cup Qualifying Rounds is astonishingly underrated; it’s where folklore is made. Sadly, losing 4-0 to Gateshead this past weekend [the time of writing], Gainsborough have missed out on reaching the first round proper once more however, they can still lay claim to being always on the cusp of a quality upset and, as such – like goalkeeping legends – will always be a big draw in my eyes. This entry was posted in 2014-2015, Conference North, FA Cup and tagged Conference North, FA Cup, Farsley AFC, Gainsborough, Gainsborough Trinity FC, Steve Sherwood, The Northolme, Watford FC. Bookmark the permalink.